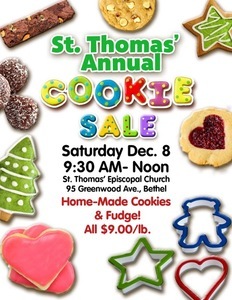 St Thomas' Episcopal Church in Bethel Announces Cookie Sale on Saturday, December 8 from 9:30 am to noon. Delicious, beautiful home-made Christmas cookies and fudge without all the mess! The cost is $9/lb. Great for parties and gifts!